In this Airline Retailing Outlook 2018 sponsored by Datalex, Travel in Motion (TiM) lays out what they foresee in the next twelve months. They look at airline retailing from various aspects, addressing each with their observations and predictions, as they attempt to forecast things that may not happen as expected or hoped. It would be amiss to say that the consumer has changed drastically in the course of just one year. But we have seen considerable change in consumer behaviours and expectations over the last ten years. Today we need to ask ourselves – “who is the consumer?”. There is not one type of consumer, but millions, or billions. Nonetheless, there are trends we can follow, and must observe for the various consumer segments. The continuing trend and expectations for things to “just work” is ongoing, as well as the expectation of the consumer to be able to do everything on-the-run and with more “me-focus” - personalisation. This “uberisation” of travel buying – reducing a process to the most simplistic (consumer) interaction model – is what consumers are getting used to. It started years ago with Amazon’s 1-Click, has taken dating by storm (swipe-left / swipe-right), and is now used to order food, transportation and other services. But, whether for purchases of goods or services, this simplicity has not yet reached the (air) travel industry. Much of this “uberisation” can only be achieved successfully if the offers and the content is personalised to an extent, as it is this which, if done well, simplifies customer interaction. In this area, we foresee airlines simplifying their mobile and web user interactions, with many launching new mobile sites and apps, but few succeeding in making it simpler for the consumer. With Facebook Messenger, WhatsApp, Line, WeChat and others, messaging-type interactions are increasing, and the consumer has a heightened expectation of what can be expected from messaging type services we call “chatbots”. According to research by ubisend, 35% of consumers want to see more companies using chatbots. HubSpot research indicates that 40% of consumers do not care whether a chatbot or a real human helps them, as long as they are getting the help they need. A small number of airlines and travel agencies are currently engaging technology companies to provide chatbots. This will continue and increase in 2018, and the chatbot capability and intelligence will improve, but not reach a high level of maturity yet. All the same, we should not forget the generation 60+, the “baby boomers”, the post-second world war generation. They often struggle with changed usability models, and the information overload on travel (and other) websites. Generations which did not grow up with content overflowing websites, unbundled travel offers, and click-and-drag interactions are often getting left behind, leaving a source of frustration. This is an issue which is not being recognised enough by the airlines, as this demographic has time and money and is willing to spend both on travel. Travel in Motion believes that airlines and most travel retail channels will continue to neglect the needs of the baby boomers, focusing on the younger, digital generations. However, the traditional travel agencies will continue to serve this group well. The final aspect of the consumer expectations is that of the “connected journey”. There is a growing expectation amongst various demographics that the travel provider – either the airline or a travel agency – will not only be able to provide a door-to-door travel product, but also accompany the customer on the journey – at least virtually. The ability to communicate with the supplier for support or more personalisation will be expected by the consumer. Some airlines and agencies will be able to provide this service level – albeit at a slow rate of adoption from these entities. 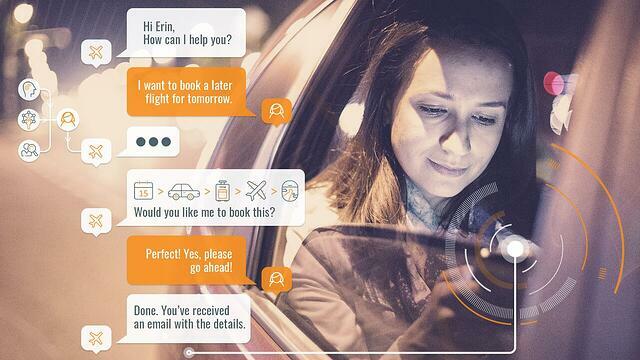 A great example of this is the WhatsApp interactions possible with KLM. Download the full white paper for the remaining sections; the trade partners, distributors, airlines and finally technology.